I grew up in a large family living in Michigan surrounded by lakes. But we never spent time vacationing at them because my mother distrusted lake water. Therefore, every summer my family would pile into our early 80’s model Chevrolet Suburban and drive a day and a half to the Outer Banks of North Carolina. It was something my whole family looked forward to every year, and to this day, though not every year, some of us still make the journey. Now that I live in DC, a trip to Cape Hatteras is much shorter (about 6 hours) though the traffic has gotten considerably worse. The secret of Hatteras has spread like wildfire since the early 90s. My Cork Hounds co-founder, Jeremy and I, with our pups Bentley* and Greta in tow, have traveled to Avon, NC for the past two years, spending a week at a beach house that stands right up against the dunes on the oceanfront. 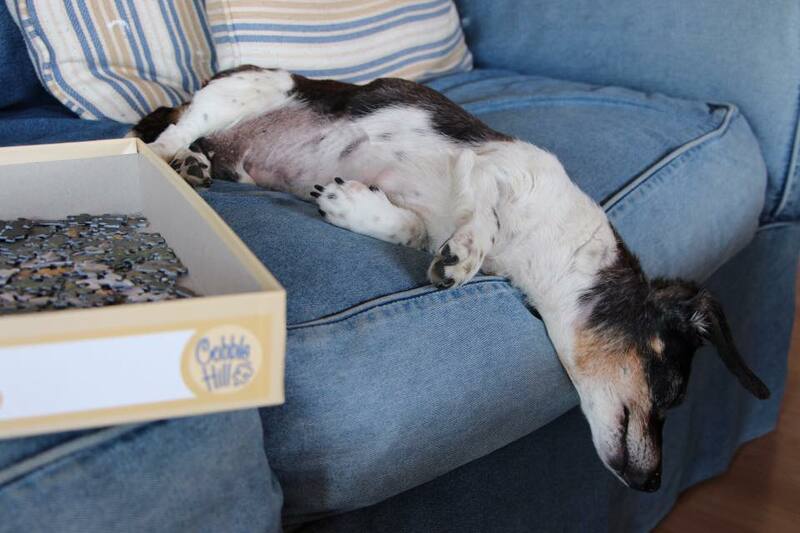 Here, we split our time between taking in the sun and sand, and building out our passion project -- Cork Hounds! While driving down, we noticed 2 vineyards/wineries along the way (using our mobile app). 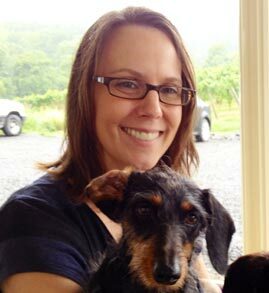 Both are dog-friendly and offer some delicious wines! Photo of the entrance to OBX Winery. Photo by Jeremy Glesner, All Rights Reserved. Don’t let the strip mall location deter you from stopping at this gem of a winery. What it lacks in atmosphere, it makes up for in taste. OBX’s motto is, “We put sunshine in a bottle to warm your heart and make you smile,” and that’s exactly what we experienced on our visit. Dogs are welcome outside (really just a parking lot with some grass), on the front porch of the store, and inside the tasting room. Half of the winery is set up with wine making supplies while the other half is for tasting. The tasting area is tight -- just a small bar, a high table and chairs and a couch for enjoying a glass of wine. When we stopped in, their little dog, an adorable Shih Tzu, was there in a pin next to the bar, greeting us with tiny barks. Greta paid no attention to the resident dog and Jeremy held her as we sipped the wines. Photo of the four OBX wines we purchased. Photo by Jeremy Glesner, All Rights Reserved. OBX has quite a variety of wines. They don’t grow their own grapes but they make all their wines onsite. Their dries include a citrusy Pinot Grigio (labeled Pea Island), a lightly oaked Chardonnay (labeled Great White), Pinot Noir (labeled Pine Island), and more. Being that it was summer, we focused mostly on tasting their sweater wines -- a Riesling with green apple flavors (labeled Greentail), a sweeter Chardonnay with natural peach and apricot flavors (labeled Perfectly Peachy) and there are more! We walked away with four bottles. If you have a weekly beach rental, bypass the liquor store and stock up here instead. Photo of the Sanctuary Vineyards sign off of NC 168. Photo by Jeremy Glesner, All Rights Reserved. 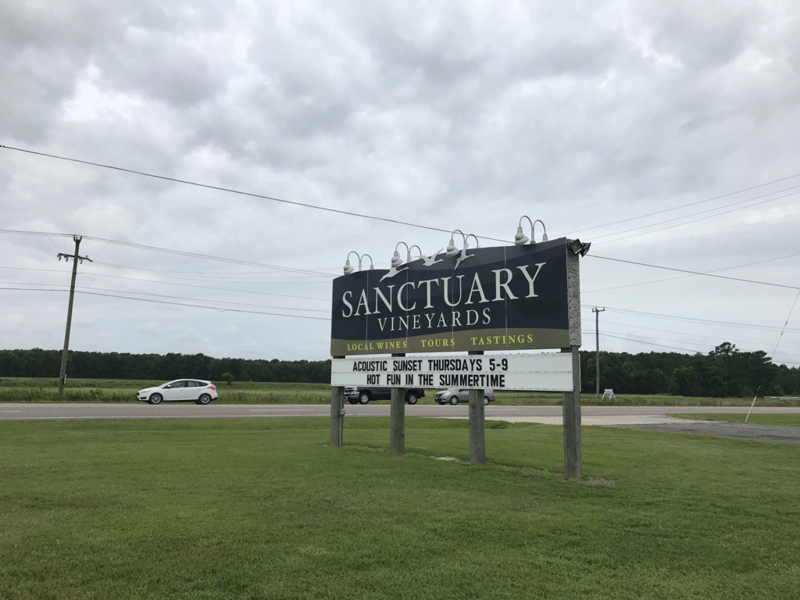 Just a 20-minute drive to the North of Nags Head, right off of NC state highway 168, you will find Sanctuary Vineyards. 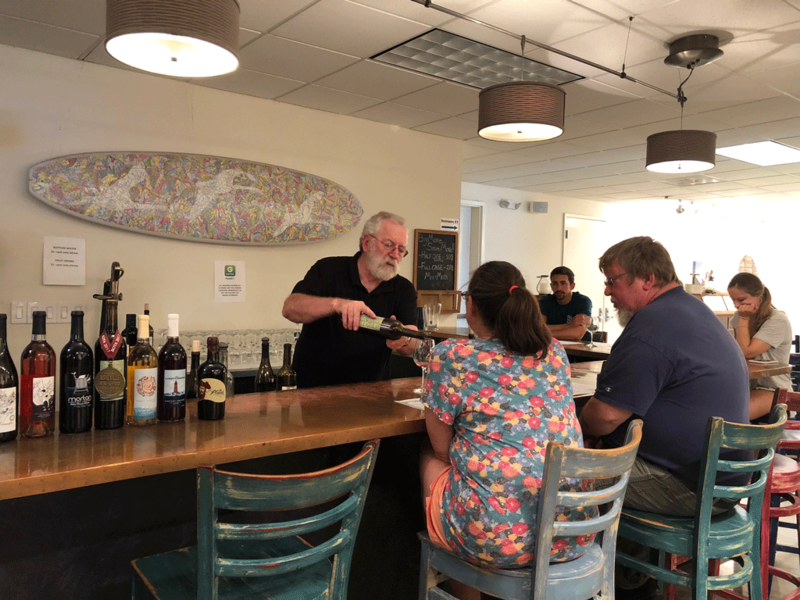 The tasting room resides in a large rustic red, country store-like building, and makes for a convenient stop no matter if you are headed to the beach or back home. A wide porch with rocking chairs greets visitors and makes for a nice cool spot in the warmer months to sit with your dog and enjoy a glass of wine. Note, if you like to shop, The Cotton Gin is right next door. Here you can shop brands such as, Tommy Bahama, Vera Bradley, Vineyard Vines and Pandora. Inside, an arch entryway leads to a large copper-topped tasting bar. Since we had a long drive ahead of us back to our homebase in the DC-VA area, I did the tasting while the DD, Jeremy, took care of my dog Greta. Perhaps feeling fatigued from her week at the beach, she slept in his lap throughout our visit. Photo of the wine bar at Sanctuary Vineyards. Photo by Peggy Mihelich, All Rights Reserved. 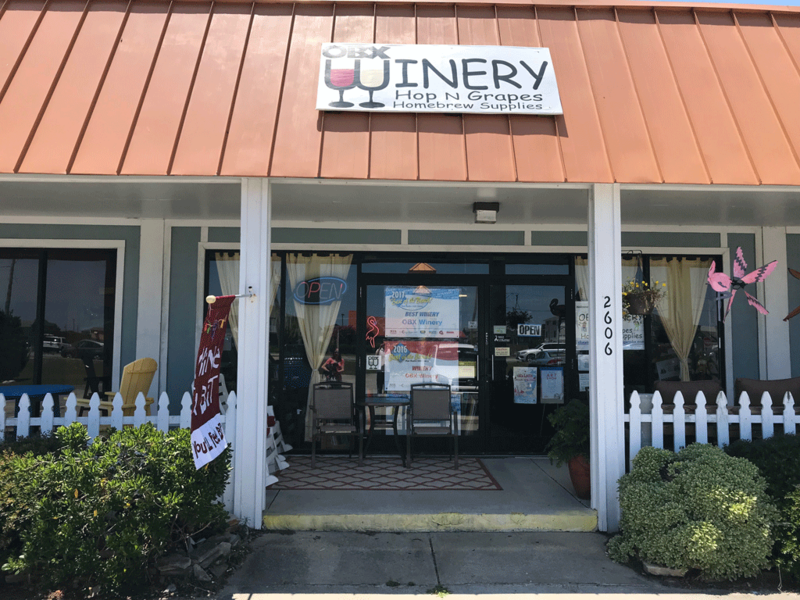 Sanctuary grows their own grapes and has a fairly wide variety of wines to offer including some sweet muscadine wines that are well worth a try. We were first introduced to their wine in June of this year when some friends visited with us from the Virginia Beach area that love Sanctuary Vineyards. They brought a bottle of the Sweet Serenity, which we both enjoyed. This muscadine is an ideal summer wine, chilled and served with a grilled meat or fish of your choice. During our visit, we went for the full Reserve Tasting, which allowed us to try all of their wines. I enjoyed most them and brought back six bottles from our visit. I was particularly taken with their wine labels. Many feature themes associated with the Outer Banks -- wild ponies, the Wright Brothers, the pirate Blackbeard and lighthouses. The Sweet Serenity label features a swirl of seashells, which I know will quickly transport me to the beach even when I’m really just back home in DC. Photo of the wine bottles at Sanctuary Vineyards. Photo by Peggy Mihelich, All Rights Reserved. There are many beach rental companies located up and down the Outer Banks. Most offer dog-friendly homes, condos and cottages. Be sure to investigate this option in addition to searching Bring Fido and Homeaway. The fertile land along the North Carolina coast makes for some very tasty fruits and vegetables. If you’re traveling from the north, you’ll start seeing many roadside farmers' markets about an hour before reaching the beach. If you are renting a home for the week, make a pit stop at one of them, grab some produce and cook up a feast with your selections. 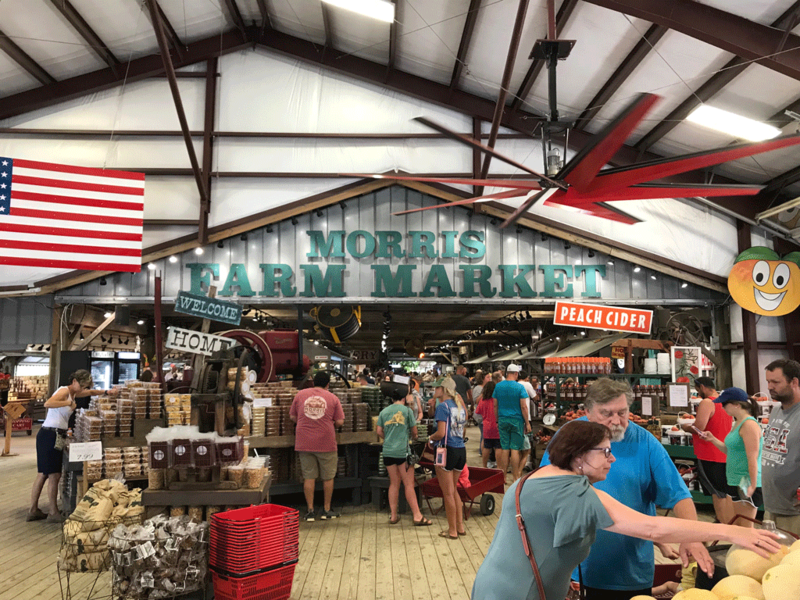 Most of the markets are dog-friendly -- Morris Farm Market is well-known for its pet-friendliness. When we stopped it was a mob scene with people and dogs! On our visit we picked up peaches, sweet corn, green beans, tomatoes, and a BBQ lunch before continuing our drive. Photo of Morris Farm Market. Photo by Jeremy Glesner, All Rights Reserved. Welcome to some of the best beaches on the eastern seaboard. Many are sparsely populated and they are dog-friendly! Hatteras beaches are known for their dunes, the natural sand barriers you must climb through to get to the beach. These dunes have protected the area through countless hurricanes and they are a gift from Mother Nature that North Carolina has wisely left alone. Some tips before you take your dog to the beach: the sand gets really hot during the day -- their paws may burn. If your dog is small, it’s best to carry them through the dunes. If that’s not an option, apply a paw wax (like Musher’s Secret) to build up a protection barrier on their pads. Many dogs enjoy the beaches, are well-behaved and are strong swimmers. The law does require you to keep your dog on a 6’ leash (https://www.nps.gov/caha/planyourvisit/pets.htm) for their safety (for the courtesy of other visitors, and the safety of other dogs and wildlife). Please follow the rules so everyone has a good time and goes home safe and sound. 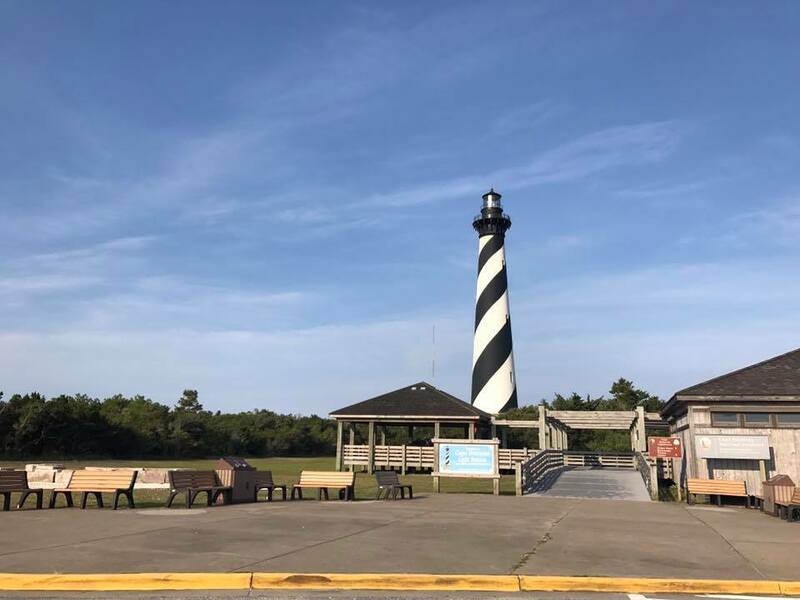 Since 1870, the Cape Hatteras Lighthouse has beamed its light out to ships making their way along this treacherous coastline. Shifting sands, rough waters and narley storms have taken many ships to the bottom. The area is known as the Graveyard of the Atlantic for good reason. Today, the lighthouse is mostly a tourist attraction, though its light still operates and it’s a sight to behold. The grounds are dog-friendly so bring your pup, though if you want to climb the stairs to the top of the lighthouse, you’ll want to leave your puppy with a trusted friend at the base while you get your workout in for the day. The climb is well worth it however, the views from the top are simply spectacular. Photo of the visitor center at the Cape Hatteras Lighthouse in Buxton, NC. Photo by Jeremy Glesner, All Rights Reserved. If you’re driving down from the north or heading back up that direction, this winery in Virginia Beach is worth a stop. 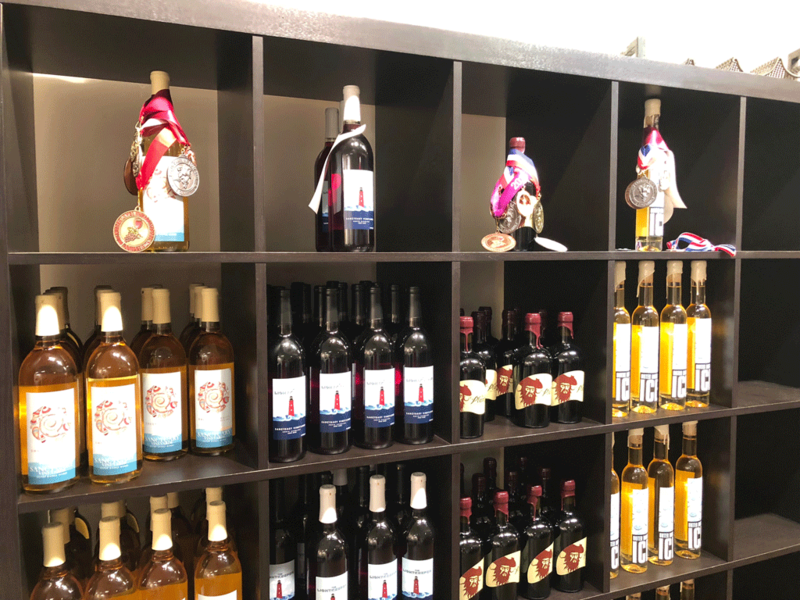 Pungo Ridge is a small farm winery specializing in fruit wines like blackberries, blueberries, strawberries, apples, pears, plums and peaches. They are dog-friendly inside the tasting room and outdoors but not on the patio. *This year, sadly, Bentley wasn’t with us, just my dog Greta. He passed away in November of 2017. He thoroughly enjoyed his time at the beach, as evidenced by this photo of him sleeping on the sofa at our rental. It is one of my favorites. We think of him often and miss him dearly. Photo of Bentley. Photo by Jeremy Glesner, All Rights Reserved. Cover Photo by Jeremy Glesner. All Rights Reserved.